If you have a busy household like mine, you can appreciate dishes that can be made in advance. 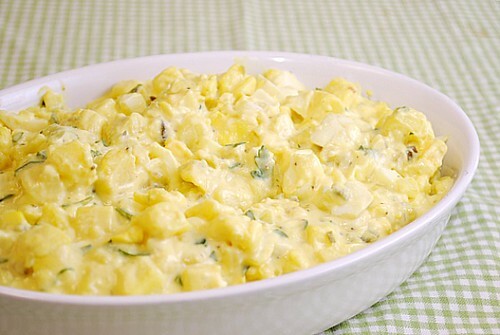 This potato salad is actually better made in advance so it has time for flavors to meld. It's a recipe that is pretty much one where you combine, stir and chill - what's not to love with that?! I've also found it's very flexible too. Change out the russet potatoes for red bliss or even buttery yukon for a new twist. Add bacon or even diced up ham if you want. This is a great salad recipe to build upon if you wanted or it's simply delicious as is. Boil potatoes, remove and drain the potatoes when just fork tender; cool to room temperature. Dice the potatoes and place into a large bowl. Cover with plastic wrap and set aside. Boil the eggs to a hard boil; cool and peel off shells. Dice up eggs and add to the potatoes. Add the finely diced onion, celery, pickle relish and parsley to the potatoes and eggs. Gently stir to combine. In a separate bowl, whisk together the mayonnaise, mustard, cream, salt, pepper and sugar until creamy. Transfer this mixture to the large bowl with the potatoes and fold in to coat the salad. Cover with plastic wrap and refrigerate at least 6-8 hours or overnight to allow flavors to meld. Potato salad is always better the next day! A classic, I like to add a bit of spicy BBQ sauce to mine just to zing it up! oh my, looks and sounds amazing. am craving a good potato salad now. And good idea on spicy BBQ sauce.